Who doesn’t know these lines and who won’t hear them this Christmas? Yet who doesn’t overlook the fact that the carol celebrates, not one, but two wonderful plants? What is it about the prickly-leaved bush with the red berries that makes us want to deck the halls with its boughs, but the poor old ivy remains firmly in the shadows, literally and symbolically? This Christmas I think it is time to stand up for Hedera helix and proclaim the many virtues of this wonder species. Yet perhaps to understand the greater popularity of our other Yuletide evergreen we need to begin with those shadows, because ivy is, for many people, still an edgy and even unnerving beast. The way it creeps slowly up the tree or wall, entwining itself like some great coiled serpent, until it can almost smother its host, gives it an ambiguous quality. Some people mistakenly assume that it parasitises other trees. It doesn’t. It attaches itself by a thousand little adhesive rootlets that take no nutrients from elsewhere, but simply give the plant support and traction as it climbs vertically towards the light. The one notable adverse impact of ivy that even the most devoted enthusiast has to admit is the prolific nature of its growth. An ivy plant can bring down the stoutest tree if it becomes too heavy or so bulky that it exposes the host to the impact of high wind. Another consequence of this luxuriance is that it can take light away, especially from hedgerow shrubs, and the ivy flourishes at the expense of its neighbours. Yet we should also celebrate ivy’s multiple gifts to our countryside. It creates wonderfully sheltered niches where all sort of other creatures find homes. The fact that it is thick with leaves in winter makes it especially important for roosting birds. Come spring it then offers them places to nest. Wrens and blackbirds love it. Another important feature of ivy is the way it keeps strange hours compared with other plants. So it flowers in autumn and fruits in winter. 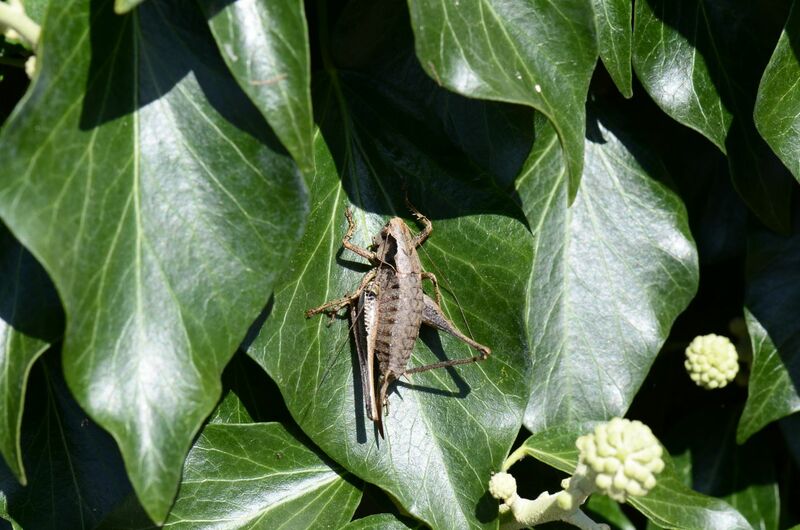 Come September or October, when the landscape is largely stripped of sugar and pollen, ivy becomes the main attraction for an entire community of insects. 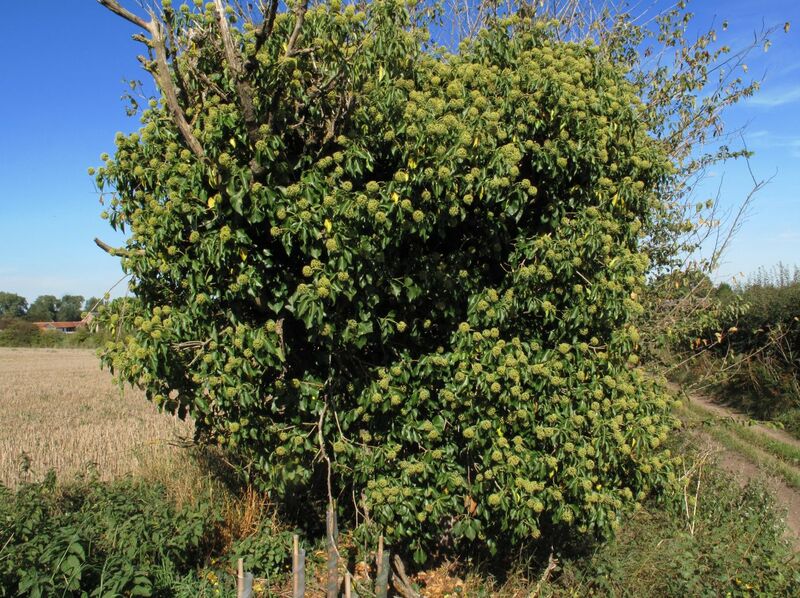 One of the great joys of autumn is a cascading ivy mound smothered in the gentle hum of bees, wasps and bush crickets. 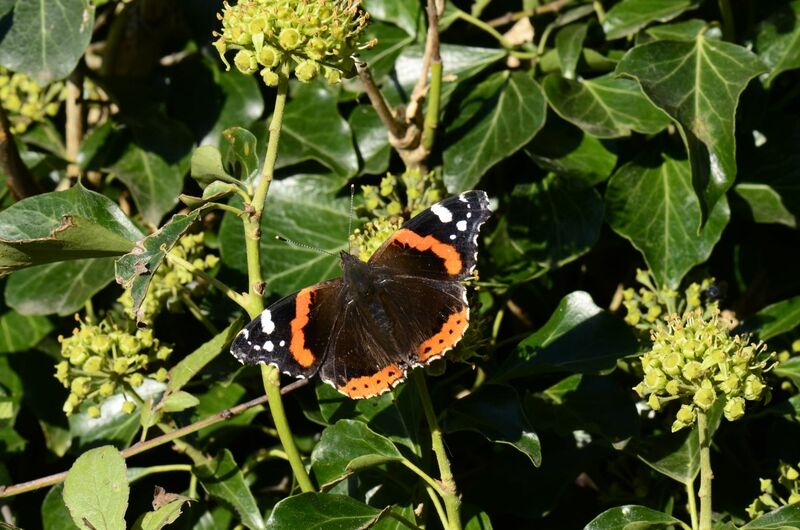 Butterflies like red admirals and commas are also partial to those weird green sputnik-like flowers that spring up among the foliage. Come true winter when the world is bare of other food sources, those purple ivy fruits are often a lifesaver for many birds. Pigeons in particular relish them but so do lots of other songbirds, including thrushes. One of my most powerful memories of ivy’s generosity was a host of hungry warblers all feasting in spring on some very succulent late fruit. The plant not only gives back to nature, it is also generous with us. One of the things that makes the dead time from Christmas to March a little more tolerable is that we are not completely without a sense of hope. Those islands of green created by ivy bushes sing out in our landscape about the possibility of life’s renewal. It is surely because of its evergreen potency that ivy was brought in doors with the holly at Christmas. It reminded us that the year was turning and good times would return. In the distant past ivy had other purposes. It was once used as a source of fodder for sheep and cattle. People also believed that it was imbued with protective magic. Young married couples in ancient Greece were wreathed in ivy as a symbol of their fidelity. In the Scottish Highlands crofters placed ivy plant around their butter, milk and livestock as a way of warding off evil. The leaves were even said to be an early form of après soleil, when they were boiled in butter and smeared on the sunburnt parts. However my favourite form of ivy is that small scrap of sky blue that flutters across the lawn on warm April mornings. 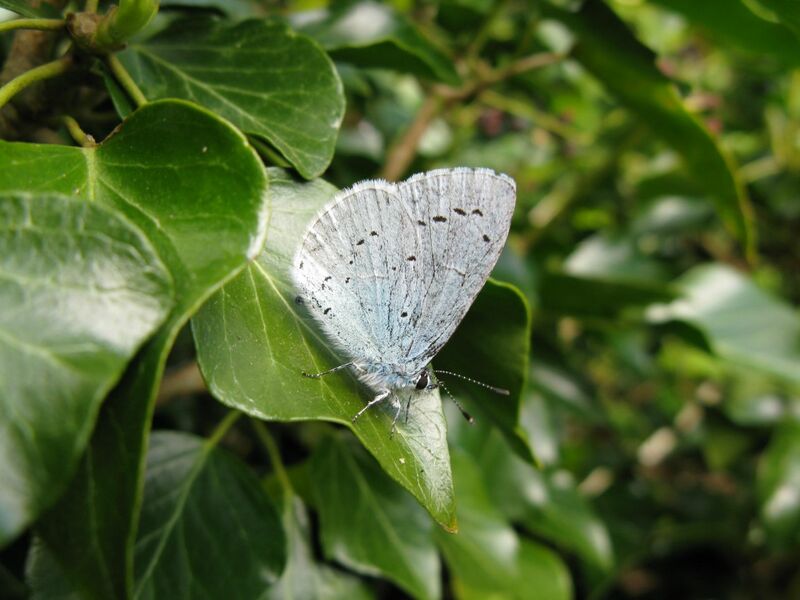 Despite its name, the holly blue butterfly lays eggs on ivy in its second generation. The tiny green caterpillars are little more than the flowers of the plant processed by the butterfly’s respiratory system. So when the adult imago emerges in spring, in effect, you are witness to ivy with the powers of flight.